Empower Her WHISTLER was a great success. 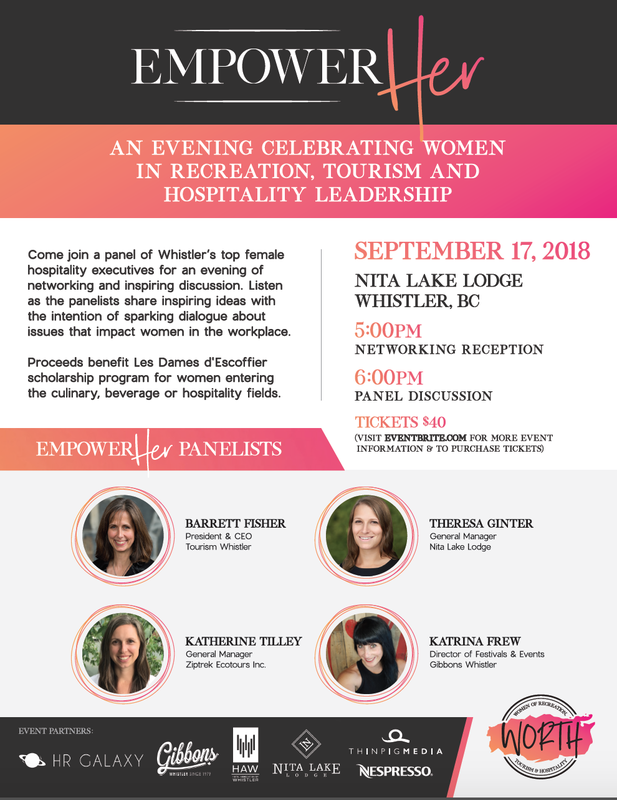 On September 17th, 2018 women from accommodation, food service, recreation and tourism were connected for an evening of networking with an inspiring panel discussion. Empower Her brought together a community of hospitality leaders to expand their network and create meaningful relationships. Presented by HR Galaxy, a panel of Whistler's top female executives shared inspiring ideas about issues that impact women in the workplace. Their perspectives and insights helped inform, inspire and empower women as we collectively identifed ways to accelerate women to senior roles in the hospitality and tourism industry. Katherine Tilley, General Manager - Ziptrek Ecotours Inc. Thank you to sponsors HR Galaxy, Nita Lake Lodge, Gibbons Group, The Hotel Association of Whistler and Nespresso.